On July 18, 1877, Governor Henry Mathews arrived in Martinsburg—on the scene of the first nationwide strike in U.S. history. Baltimore and Ohio Railroad workers had walked off the job in response to a pay cut. The strike soon spread along the rails from Baltimore to Chicago. 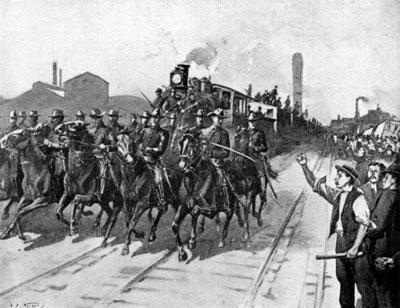 The strike’s first violence occurred at Martinsburg, where workers stopped the trains from running. Mathews had dispatched the state’s militia to put down the strike, but most of the militiamen were friends or family of the strikers. At one point, a striker fired at the militiamen, who shot back and mortally wounded the railroad worker. The militia then withdrew and refused to take further action. Mathews sent another militia unit from Wheeling, but it also failed to stop the strike. The day after Mathews arrived, federal troops ended the work stoppage in Martinsburg, although violence continued elsewhere in the nation for weeks, with some 100 people losing their lives. The strike showed that West Virginia authorities were ill-prepared to handle unrest among laboring groups and led to calls for developing a professional national guard to control labor disturbances.